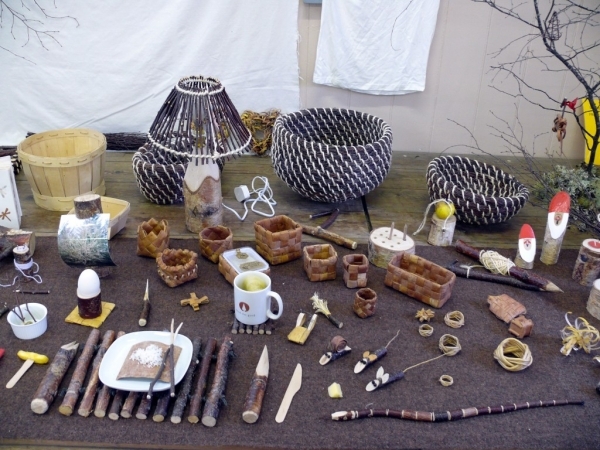 Over the weekend 25th/26th February 2012 we were fortunate to learn how to make many varied birch creations. Bryce originally learnt from Steen Madsen and Anna Norgaard from Denmark, and has since broadened his knowledge thru trial and error and learning from places as far flung as New Zealand and Ecuador. 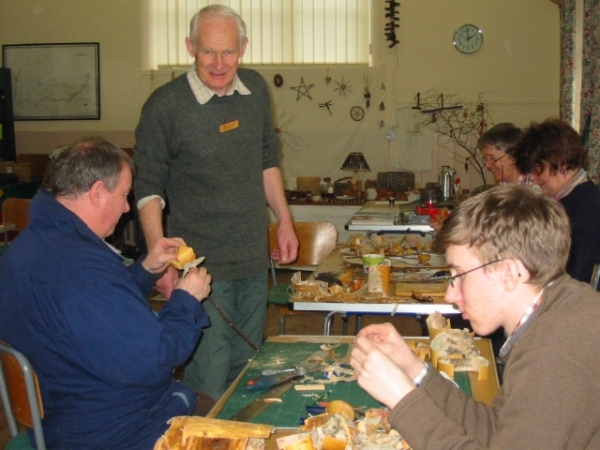 On the first day we learnt the basics using small pieces of bark, making mini bags, flowers, Angel Fish, and heart purses. 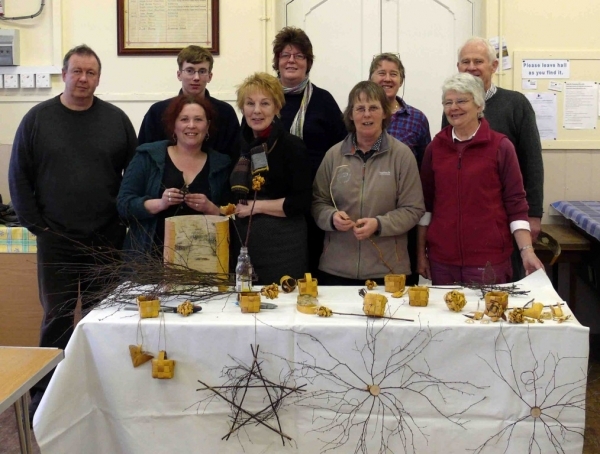 We also made pentagrams, and wall hangings which show off the beauty of the willow twigs. 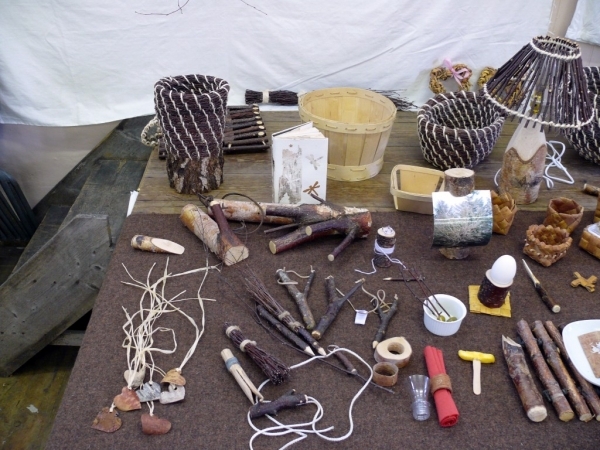 Even the tiniest, thinnest scraps of bark were used to punch out shapes for cards or jewelry using a craft punch in the shape of bees, dragonflies, hearts etc. 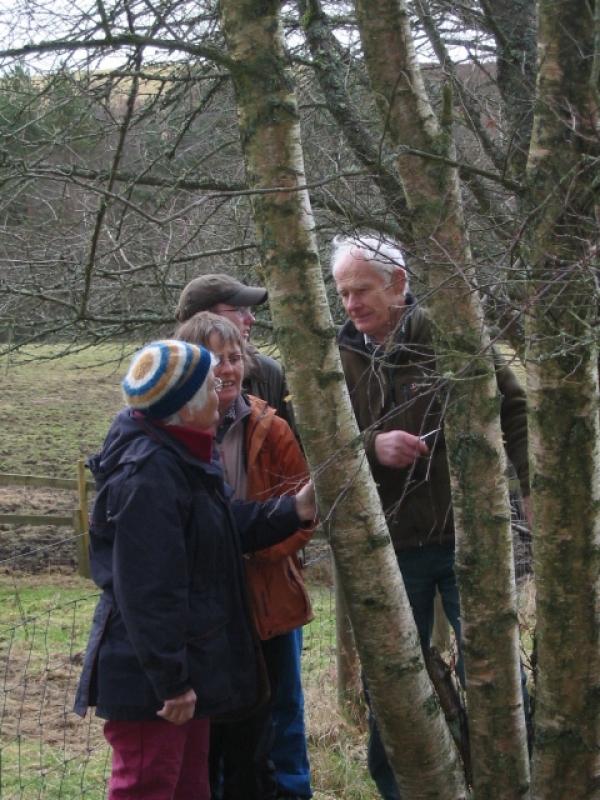 On the second day we visited Gill's young deciduous woodland and helped to reduce the vigour of the birch regen by harvesting roots and fresh twigs. While we were there Bryce showed us how to harvest bark (see photo.) and told us that the best place to dig birch roots is where there's sphagnum moss, because its nice and clean. 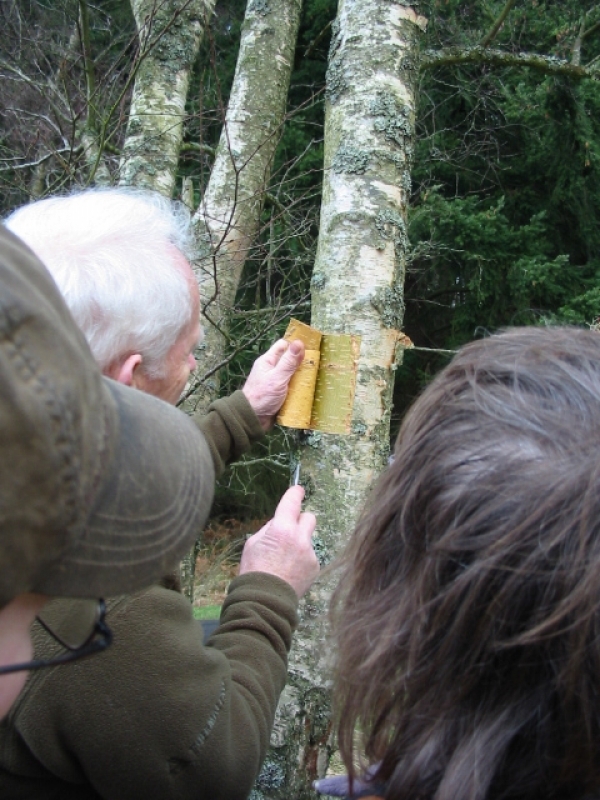 Apparently the best birch is found in conifer plantations where the shaded side will give the cleanest stems and the best time to harvest bark is during the late spring and early summer when the sap is rising. In Sweden they use a fifteen year rotation for harvesting bark, though Bryce said he never goes back to the same tree. 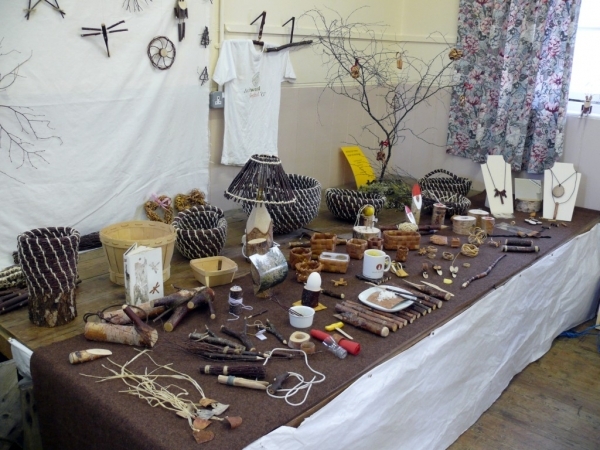 The bark can be used immediately, or can be stored in a cool dark place for several months or even years. The oil in the bark prevents it from degrading but it must be stored between flat boards or it will curl up. 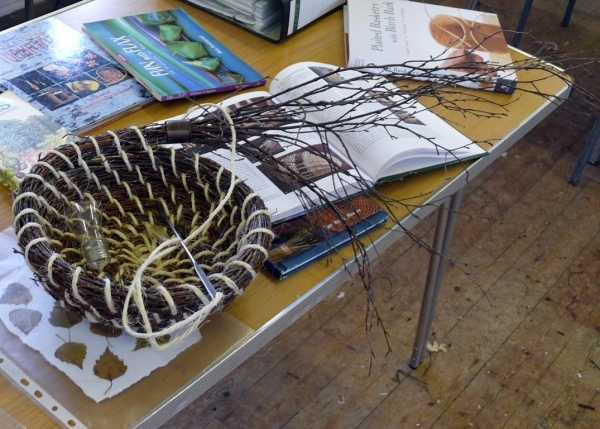 We learnt to make a small square birch bark basket using the largest smoothest sheets of bark. The baskets have a lovely pale yellow colour both inside and out. The lenticels make a nice pattern as they are in lines according to the orientation of the woven strips of bark. 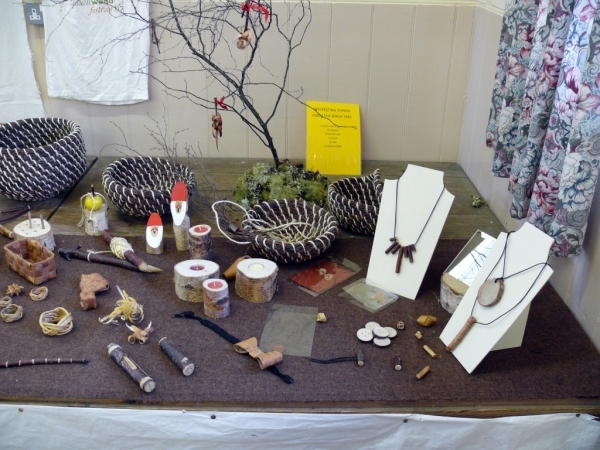 We also made birch Crysanthemums made of the waste bark cut into strips, spiked onto a birch twig and then boiled to make them curl.